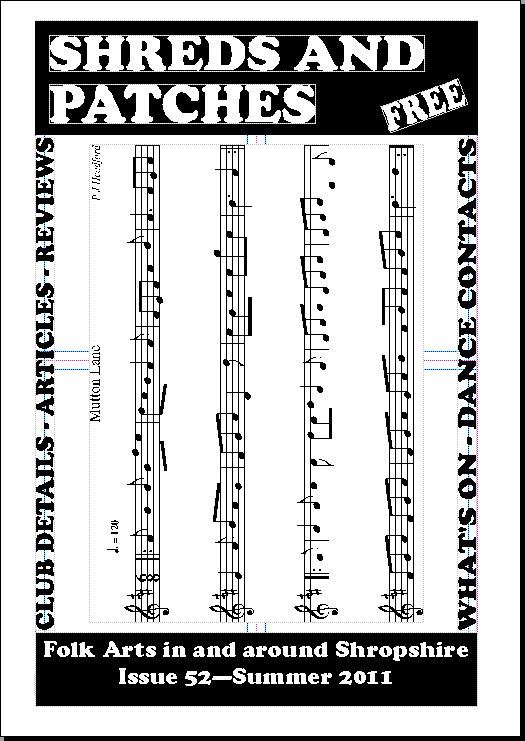 Shreds and Patches is a free magazine focused on folk pursuits in and around the county of Shropshire. It is compiled in Wellington, on the western outskirts of Telford. We publish it three times a year and distribute it free of charge. Currently, 700+ readers receive it through the post and the remainder are placed with libraries, clubs, festivals and other venues. You can put your name on the mailing list. You can also find more technical information about the magazine. Sheila Mainwaring is the Editor, assisted by Flos (Phil) Headford. Sheila is a nationally-respected and universally popular caller for dances (ceilidhs, clubs, workshops, weddings, etc). Flos has a long reputation as a top-flight fiddler with national and local English Country Dance bands. Find out more about Sheila or Flos. Shreds and Patches derives its running costs from advertisers, and from voluntary contributions. This allows complete editorial freedom. We take this opportunity to thank all those who have, over the years, sent us tokens of gratitude. If you fancy the idea of holding a barn dance, you need look no further - Sheila is a top-class dance instructor (caller) and MC, Flos is one of the best dance fiddlers around, and we can put together all you need for a rattling good evening. This website is hand-coded in HTML 4.0. All pages are checked for validity using the Validator provided by the World Wide Web Consortium (W3C) at http://validator.w3.org/. They provide the badges in the left-hand column.